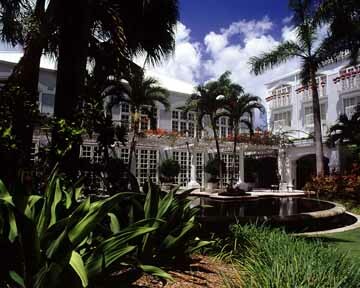 The finest contemporary hotel in the Cayman Islands is the Hyatt Regency. 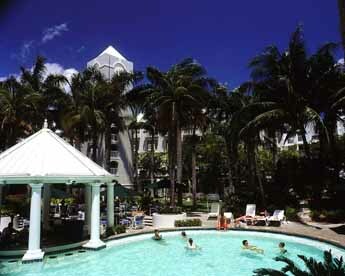 The Hyatt dominates the Seven Mile Beach architecturally and imposes an air of British royalty. Two of the four tennis courts are in front of the property and the golf course sprawls to the rear. are magnificent, even with the dry climate. 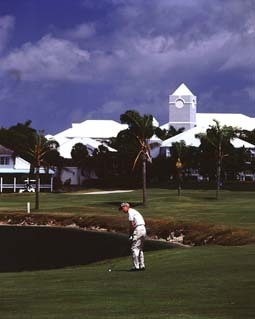 The Hyatt Regency is only a few miles outside of George Town and consists of a ninety-acre Britannia resort which includes the Jack Nicklaus-designed golf course, a private marina and a community of villas. The Spanish courtyards and gazebos give the feeling of lush tropical climate - when in fact you are on the Caribbean's driest island. There are villas that range in size from one to three bedrooms, with large kitchens and patios that face the private marina and/or golf course. The hotel suites are lavish and tastefully appointed. The Regency Club rooms provide private concierge services and a daily cocktail party. Complimentary amenities provided for guests include TV, phones, mini-bars, safes, bathrobes, ceiling fans, king-sized beds and air conditioning. The villas are equipped with a dishwasher, washer and dryer, microwave, walk-in closet and two bathrooms. The Hyatt beach complex, directly on the beach has 44 one-bedroom junior suites and 9 two-bedroom suites. There is a coffee bar, ice cream cafe, rooftop sundeck, health club, Red Sail Sports facility with a scuba training center, retail shops and a sushi restaurant. and is casual at breakfast and elegant at candlelight dinners. Hemingways is a favorite for dining and drinking. Their specialities are mainly seafood that you find on the island. Across the street at the main compound there is the Garden Loggia which serves American, Continental and Chinese cuisine. The Hyatt of the Grand Cayman Islands includes an exclusive full-service Britannia Beauty Spa. The staff includes eight European-trained therapists and treatments of hydrotherapy, seaweed wraps, reflexology, massage, aromatherapy and body exfoliating. There are two wet and four multipurpose dry treatment rooms with their own stereo system, shower and changing facilities. The health club includes its own pool and a juice bar. The Hyatt Regency Grand Cayman is intended for the upscale guest and offers luxury beyond any other accommodation on the island.